Leave it to politicians to find ways to leave loopholes huge enough to drive trucks through when putting together legislation that will limit who can contribute to their campaigns. Measure H calls for limiting contributions to candidates for city office from parties bidding on contracts of more than $100,000. That’s good. Under Measure H, bidders on city contract are not prohibited from contributing to independent expenditure committees that are allowed to spend their funds on behalf of a candidate, as long as they candidate does not direct the expenditure. While Measure H is not perfect, we believe some reform is better than none. Amendment I—An Office of Rate Payer Public Accountability and Ratepayer Advocate is not a new idea. Many utilities have them and it’s about time the DWP joined them. We would have preferred a measure with more teeth, but this is a move in the right direction. The Los Angeles Department of Water and Power (DWP) belongs to city residents who elect the city council members to represent their interests. So it was very disturbing to us when the DWP stalled on their commitment to contribute $73.5 million to the city’s strained budget. This measure amends the city charter to require the DWP to coordinate its budget process with the city, and requires the DWP to submit its preliminary budget to the council by March 31, for the coming fiscal year. We say its about time. Requiring a city owned asset like the DWP to present audited financial statements so it can be determined if and how much surplus the DWP had the prior year, so it can be determined if a transfer of surplus funds can be made is just common sense. We don’t believe there are many people in the city who feel good about cutting funding to the city’s libraries, and that includes us. But given the city’s huge deficit, cuts must be made. We don’t believe it is good budget management to amend the charter to guarantee a percentage of revenue to one city agency over others, and that includes for libraries. Mandating an increase in the percentage of the budget libraries receive may feel good, but it is bad policy. If residents want more money for libraries, they should approve a new taxing or revenue raising measure on the next election ballot—Vote No. Taxing medical marijuana collectives as businesses, when they are currently operating as non-profit entities is sure to result in a legal battle. We’re not sure it is a prudent plan considering the federal government still considers marijuana an illegal drug. But since the sales are on going and large according to some, some feel we may as well tax until the issue is resolved. Measure M is another of those poorly thought out and constructed measures that raises more than it answers. No recommendation. Removing provisions from the city charter deemed by the courts as unconstitutional is the right move. Measure N will remove from the City Charter provisions on campaign financing found to be unconstitutional. By law, all changes to the City Charger must be approved by voters.—Vote Yes. With the price of oil now at $99 per barrel, adding another $1.44 in oil extraction fees for oil companies does not bode well for the price for a gallon of gas at the pump. That $1.44 is what the city of Los Angeles wants to charge oil companies extracting oil within city boundaries. Most of the companies the tax will affect are small businesses. While they may not influence the global price of oil, it makes no sense to add to their cost of doing business during these tough times. The city already charges businesses taxes on their gross receipts, the new revenue to be generated may at first glance bode well for the city, but it will hurt the local economy. This tax won’t only cost the oil companies, it’s going to cost at the pump. We will let the voters decide if they want to go along with this tax. Creating a city emergency reserve fund to be used for actual emergencies is just prudent fiscal management. It seems to us that locking up 2.75 percent of the general to prepare for unanticipated emergencies such as fires, earthquakes and floods is a good way to keep the council and mayor from continuing to spend all the city’s revenue today with little regard for the future. The city wants to amend the charter so the personnel department can if necessary limit the number of civil service applicants for civil service jobs. City departments have been overwhelmed by the number of applicants they receive and the requirement that all who apply be tested. As long as there a way to do this in a fair and equitable way, such as ensuring through public notice when job become available and the timeline to apply, we have no objection. The most public and equitable way to award solid waste (trash) franchises is through an open bid process. While we do not understand why trash hauling businesses have been singled out for special attention, or why the measure is not being applied to all large city contracts, adding this open bidding process to the Monterey Park Municipal Code is a step toward greater transparency in the city’s business.—Vote Yes. Term limits for city council or any elected office have not proven themselves to be without problems, but we don’t believe the problem of constant campaign fundraising by elected officials in search of their next political office will become an issue that hurts residents in some small cities like Commerce. We believe three four-year-terms (12 years) is long enough for council members—Vote Yes. The Office of Independent Review (OIR)—the independent oversight entity entrusted with reviewing deputy-involved shootings and other critical incidents involving members of the Los Angeles County Sheriff’s Department—on Tuesday, Feb. 22 released its review and report of the Los Angeles County Sheriff Department’s Investigation into the Death of Ruben Salazar. Chief Attorney Michael Gennaco, and Deputy Chief Attorney Julie Ruhlin, both of the OIR, discussed the report and answered questions from media and a handful of community members during the press conference. This report is a summary narrative of eight boxes of materials that comprised the LASD’s Homicide Investigation into the August 29, 1970 death of Ruben Salazar. Click on the images below to watch the news conference. Unions representing workers in Vernon were placed into an interesting position after a “good friend of labor,” State Assembly Speaker John Pérez, introduced AB 46 to dissolve the city of Vernon last December. Though Pérez insists the bill is aimed at rooting out corruption, and not an attack on jobs, unions are joining the city and local businesses in opposing this bill. They have seen their employers’ financial books and are convinced that by getting rid of the city of Vernon, and leaving it open to annexation to other cities, legislators are jeopardizing the union jobs that seemed to have found refuge in Vernon, say union leaders. “Next time we sit down at the table with everything going through the roof, how are we going to negotiate around those cost increases?” said Janet Schabow spokesperson for the International Association of Machinists, which represents workers at rendering plant Darling International, glass manufacturer Owens-Illinois and the the UPS trailer shop in Vernon. The electricity costs in Vernon are substantially lower than in surrounding areas, they say, making all the difference for these companies, many of them operating under tight profit margins. Vernon has also tolerated, if not welcomed, industries that are shunned in most other cities. “Every business you don’t want in your own back yard is in Vernon,” Schabow said. The city started out as a center for the meatpacking industry, but there is no reason for any meatpacking company to stay in the state if the price is not right. Vernon still has a few, including Farmer Johns, which would be affected if AB 46 passes, say union leaders. A loose coalition of five or six unions in Vernon, formed with the help of an independent consultant hired by the International Brotherhood of Electrical Workers, IBEW, have been getting together every week since the beginning of this year, hoping to influence the outcome of the resolution. “It is truly unusual to be at these Wednesday meetings with basically the Chamber of Commerce and Vernon,” said Schabow, who just started attending the meetings. The coalition has gotten its own lobbyists to meet with Pérez, and is trying to get the ears of officials at Los Angeles City Hall where annexation of Vernon is being considered. “We’re talking to any legislator that will listen to us about how this is a bad idea, and we’re offering alternate solutions,” said Stan Stosel of IBEW, Local 47, which represents utility workers at Petrelli Electric, the contractor that runs Vernon’s municipal power plant. The L.A. Labor Coalition’s Executive Secretary-Treasurer Maria Elena Durazo has gone up to meet with the Speaker’s staff on the unions’ behalf, he said. Union members have also participated in a marketing campaign spearheaded by the city, which is spending $65,000 a week to air television and radio commercials, and place ads in local newspapers, including this one. In the television commercial, union employees join with public safety employees, other city staff, and a local teacher in extolling the benefits of working in Vernon. Pérez comes “from labor, so it should resonate with him how important this is to us,” said Stosel. Before he became a state assemblyman, Pérez was a labor organizer for the United Food and Commercial Workers. Labor has been credited with getting him into office. “It certainly makes it an interesting discussion,” said Speaker Pérez’s spokesperson John Vigna, who maintains they are “targeting corruption,” not jobs, with the bill. “The Speaker understands the difficulties workers in Vernon face. He’s worked for a company that has to meet the bottom line while also paying their employees wages,” he said, adding Pérez is known for being strong on job creation. They are working on refining the bill to address the concerns of the unions, Vigna said, but Vernon’s government must be addressed. Even if the city’s adherence to their motto “Exclusively Industrial” seemed to have benefited some employers and workers, “you don’t have a real democracy, regardless of the different nuances of all this,” he said. “At its core, cities provide services to its people,” and if a city puts its focus on anything else, “you have the inevitable results of corruption indictments,” he said. 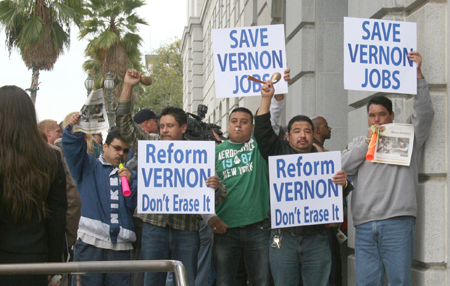 But while Pérez’s office argues that Vernon’s history of corruption indictments and charges makes the bill necessary, some union leaders are faced with a history of their own – the decline of good paying union jobs. As a result, they “have to hold the line on every job we can,” she said. Meanwhile, Ed Rendon of the Teamsters says they “agree in principal” with the bill. “What’s gone on in city hall is pretty bad,” he said. He applauds Pérez, as well as Los Angeles Councilwoman Janice Hahn and County Supervisor Gloria Molina for “wanting to do something,” and the unions “would like to find a way to help that process, however, if it negatively impacts our members and employers” they will not support it. You may have seen the signs popping up around town, signaling that it is once again time to choose the right leaders to run your city. But who are the people behind these names and are they qualified to do the job? Will you know who to vote for come Election Day? To help you answer these questions, Eastern Group Publication is speaking to city council candidates vying for seats on the Monterey Park and Commerce City elections on March 8. The first few interviews are published here, while the remaining candidates will be profiled in the next issue. The order in which these profiles are published in no way reflects a greater preference for any of the candidates. Candidate George Kevanian has a problem with the way most campaigns are run. “The biggest problem is a lack of integrity. It is a popularity contest, and the least qualified people are getting voted in,” he said. He and slate running mate Jose Acero are not taking any campaign contributions, nor seeking any endorsements. Acero ran in a past election, and for this one decided to recruit Kevanian, a 7-year resident who was not already mixed up in local politics nor involved in the local business community, to join him. He does not feel financial contributions should be par for the course in these campaigns, rather elections should be limited to just the vote, which is not dependant on someone’s economic background. “Your vote is no more special than anyone else’s,” he said. It was the recent parks and recreation fee increases, though nominal to most people, thatspurred him into running for city council office. Even the smallest increases will shut out those who need those services the most, he said. “They’re alienating the segment of the population that isn’t well-to-do, and that’s not right,” he said. Other solutions should have been considered, such as a waiver system; and the increases should have been secondary to cutting the salaries paid to top officials. Kevanian is a federal investigator for the IRS and a reserve police officer. He says he grew up in a rough neighborhood in Hollywood where you either joined a gang or stayed indoors. Growing up he looked to police officers and short-lived sports programs as safe havens, and says Commerce needs to protect the accessibility of its services no matter what. His style on council would be similar to his approach to his job as an investigator, serving as an expert witness in court where he says he has never lost a case. “All we do is state the facts” in order to convince a jury of 12, he said. Candidate Denise Robles says she is a voice for the people who “will talk and have a cup of coffee on the front lawn,” but are unwilling or too afraid to go into city hall to speak their minds. “I have spoken many times, and I feel by being there, I am being the voice of the community,” she said. It was through her experience on the library and community services commissions, and her attendance of the budget meeting and a blue ribbon committee on city fees that has led to her decision to run for city council. “It is what has kept our city going for the past fifty years with free services, including all of our recreation programs, our libraries,” she says. Robles has put a strong focus on taking care of the needs of businesses. She says her husband is a self-employed general contractor and she is very familiar with the complicated, lengthy process that many businesses go through with the city. One of her goals is to make this process easier for businesses. Robles is an H&R Block tax preparer and a mobile notary. She has also worked for Southern California Gas Company, as a school district office manager and as a loan specialist. She says her experience in business helps her see what most consumers don’t see, such as the fees and taxes that businesses must pay, as well as regulations that affect them. Robles is running on the same slate as Joe Aguilar, and she has garnered endorsements from the Los Angeles County Federation of Labor, the City of Commerce Employees Association, the Industrial Council, Councilman Aguilar and Mayor Tina Baca Del Rio. Incumbent candidate Joe Aguilar says he is an “individual who thinks things through thoroughly” when he makes his decisions. “I study things. I know the pros and cons,” he said. He is known for putting in the most hours at the city, between 20-25 hours a week, he says. Aguilar has had a front row seat to the inner workings of the city of Commerce for close to fifty years, having served for 42 years as a city employee in the Parks & Recreations Department. He says he worked at Bristow Park when it had a gang problem, which they were able to clean up. Aguilar said he ran in 2006 because he thought he could “do the job just as well, if not better” than the council members at that time. At the time he promised to keep city services intact and to work with industry; he says he has done so successfully. Aguilar says he has had a part in many of the city’s major successes, including the opening of the new Costco Business Center, the third phase of the Commerce Citadel expansion that brought in 35 new stores, and the development agreement with Craig Realty, which manages the Citadel, to handle the Urban Entertainment Project. He was especially instrumental in filling city positions that if left vacant would have hampered city services for residents, he says. He defends the decision to raise parks and recreation fees, saying that the city council kept fees as low as they could. Some top officials did take pay cuts, but their salaries must stay competitive, he says. “If you’re going to get quality staff, individuals that know what they’re doing, you are going to have to pay for them. If you get wages down so low that candidates go elsewhere, you’re really not going to get quality services,” he said. But in walking precincts during the campaign, he found that most residents seemed to understand why the city made the fee increases and were more concerned about the upkeep and property values of the homes in their neighborhoods. See the next issue for profiles of Shawn Estrada, Ray Gordy Cisneros, Jaime Valencia, Elizabeth Flores, and Jose Acero. “It’s good to vote for somebody nice,” said candidate Teresa Real Sebastian, but people must also make sure to vote for someone who is informed. “I’m not just another ‘yes’ person who just stamps it and looks the other way,” she says. Some council members look like they have not even read the agenda reports prior to voting, she says. She enjoys getting into the nitty-gritty details of city issues and has attended almost all of the city council meetings in the past year. She regularly researches agenda items and takes advantage of the public comment period to question city policies. She doesn’t consider herself a politician, but rather a “resident representative.” A city council seat is nothing less than a full-time job, she says, so she is putting her regular job on hold to be on council. She is someone who throws herself into everything she does “full throttle,” she says. Sebastian’s family has been in the city since the 1970s. She runs a small commercial real estate financing company Sebastian Partners, Inc., located outside the city, and has past experience working as a real estate attorney at major Fortune 500 companies. Given her real estate background, Sebastian says her strong suit is in understanding economic development issues, which will be useful in moving redevelopment projects along and getting nationally branded stores into the city. She thinks that not only are residents fed up with the lack of transparency and corruption that seems to go on in cities everywhere, businesses are also unhappy about it, and she aims to clean up the city for all stakeholders. Candidate Hans Liang first became “fired up” when he began tuning in to city council meetings two years ago, only to find “infighting and bickering,” with “a lot of personal attacks” getting traded. This behavior, he felt, was at the expense of getting real city work done. He says issues like the budget seemed to drag on while council members asked for audit after audit of the numbers, even though those audits came up with the same answers. He wants to put city projects or goals – whether it is implementing policy or increasing city revenue – on a schedule, with a requirement that measureable outcomes be presented at the end of each stage in the process. Liang, a probation officer, said four years ago he was asked to bring the nearly defunct Asian Pacific Probation Officer’s Association back to life, despite being initially apprehensive about taking on the leadership role there. But the experience, which involved building relationships with union leaders, exposed him to the important role of public officials, he said. He also wants to give back to the community where he was born and raised. “I’ve been to 14 countries, but I still come back to Monterey Park,” he said. He loves the food, running every morning in the hills, and the diversity. He eventually wants to raise his family here. Getting more redevelopment projects off the ground and national chain stores into the city are important goals for him. Other cities like Arcadia have malls that are attracting people from everywhere, including Monterey Park, he said. Sarnoi said his MBA degree from Azusa Pacific University and BS in Finance from Northern Michigan University has prepared him to tackle the city’s budget deficit. He would be the first Thai city councilman ever in Monterey Park if he is elected, and the second in California, so he has supporters in the local Thai community. He also has supporters in the Latino community because he speaks fluent Spanish after being raised part-time by close family friends, he said. He also speaks a little Chinese from traveling to China for three months. Sarnoi took an early hit in his campaign when Sheriff Lee Baca retracted his endorsement after the local media reported that he faces pending battery charges following an altercation with his former girlfriend. “They’re false allegations… when the trial comes, I will be exonerated from all of the allegations,” he said. Incumbent Anthony Wong says he wants to “bring back tourism” to Monterey Park. An ordinance prohibiting tour buses that was put in place in 2005 has hampered the local tourism business, he says. He says allowing tour buses back to Monterey Park would bring back immediate revenue through the hotel use tax. Wong believes there is immediate interest from the tourism industry to fill the local hotels. A 24-year resident, Wong also owns and runs Concord Realty in Monterey Park. This means he spends almost all of his time in the city, he says. “I work hard, spend at least 10 hours a day for city business, and I know the real estate business,” he said. Wong’s business presence in the city has caused some fellow council members to become suspicious, however. He recently ran into potential conflict of interest issues when one of his clients decided to locate at the Atlantic Time Square mixed-use project. The city has referred these accusations to the District Attorney’s office. Wong at the time said there was never an intention to benefit from the project, and he and the client, whom he said he had been helping as a friend, have since backed out of any kind of agreement that was made, intentional or not. Wong is insistent about sticking only to the positives, directing much of his attention to economic development issues and making suggestions for increasing city revenue. He says he is interested in sprucing up the facade in downtown Monterey Park, attracting nationally branded stores to the cleaned-up Operating Industries landfill site, and transforming the obsolete industrial area on Monterey Pass Road into a regional commercial center. See the next issue for profiles of Luis Estrada, Mitchell Ing, Joe Ray Avila, and Bob Gin. Members of a local seniors’ club recently recalled how the surrounding landscape has changed, and in many cases improved. “This building wasn’t even here when I was growing up,” said Terry Faria during a meeting at the Hazard Park Recreation Center on Feb. 12. The seniors say they are worried about what cuts to Los Angeles’ Parks and Recreation Center programs will mean to low-income children and seniors on a fixed income. The meeting was organized by the Liberty Hill Foundation for the Los Angeles Park Alliance (L.A.P.A.). Rose Marie Lopez, a now retired deputy for County Supervisor Gloria Molina, jokingly said seniors have nowhere else to go but senior clubs and casinos. But seriously, seniors look forward to meetings and their special events, “It’s better than staying home and crying,” Lopez told EGP. 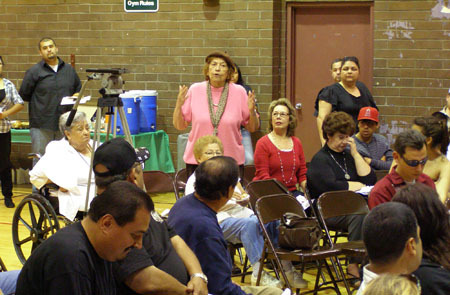 Gonzales, Lopez and five other members of the Rose Hills Senior Citizen’s Club where among the dozens of local residents joining L.A.P.A.’s efforts to organize opposition to more budget cuts to the city’s Department of Recreation and Parks. “We need to organize and march! That’s the only way they’re going to do anything,” said Lopez. Others suggested passing out flyers, talking to the media, going door-to-door and assigning a captain to each neighborhood to increase community involvement. “It is often forgotten that the senior citizen programs are among the most attended, the most appreciated and again, the most useful alternative for people,” said Steve Weingarten of People for Parks. Parks play an important part in preventing young people from joining a gang that can’t be substituted by more policing, Weingarten said. According to L.A.P.A., the proposed cuts to city parks could send Angelenos back to the dark-ages of the 1980s when public parks were neglected, unsafe and off-limits to many children. Low-income neighborhoods could be the most hurt by the city’s cuts to the park and rec’s budget, the group says. People in wealthier areas have resources to raise money to subsidize programs, and residents in those areas can afford to pay for private classes and activities, they added. L.A.P.A. claims park and recreation programs are facing a $44 million budget reduction and gives the specific example of staff reductions and facility closures at Hazard Park (including the Armory), Ramona Gardens, Ascot Hills Park and Rose Hills; as well as pool closures at Lincoln and Costello recreation centers. But the Dept. of Recreation and Parks says they don’t know where L.A.P.A. is getting their information because the mayor has not yet released any specifics on proposed cuts. “Per the City Charter, the Mayor has until April 20 to prepare and release the budget for the next fiscal year [that ends June 30] and then the council process begins,” Regina Adams, Executive Officer for the Los Angeles Dept. of Recreation and Parks told EGP on Tuesday. “They’re [L.A.P.A] giving out a lot of wrong information that is not true,” Adams said. Whatever cuts are announced, Adams and Weingarten agree they will be on top of the $38 million in cuts made to the parks’ budget last year that resulted in reduced hours at recreation centers. L.A.P.A. points out that last year’s cuts resulted in the closure of some licensed childcare centers and therapeutic recreation programs, and pushed a number of employees into early retirement. While the L.A.P.A. organizing meetings involve local unions that represent recreation and park employees, Weingarten says the efforts are not self-serving. City parks are places for people to get exercise and they provide alternatives to gang violence and criminal activity. He says parks are an affordable recreation alternative for cash-strapped families. Weingarten says they understand that the city has terrible budget problems, but adds that park employees have already gone years without a raise and have agreed to pay more into their pensions. “We fully believe they are trying to work with the city,” he said. The cuts to park have been disproportionately high, he added. Adams says that layoffs and furloughs are possible but employees across the city and not just parks and rec employees. She also says the public should expect to see changes, like reductions in services or hours because current programs are not sustainable in this economy. “Our first priority is to make sure that the parks are available and accessible to the public,” so if there are cuts, Adams said it may be to recreational programming. She said “access to the parks” doesn’t necessarily mean having access to a facility, but rather to all the other amenities within a park. Whether that means an “actual facility or recreation center, we don’t know. Responding to complaints about unexplained municipal accounts discovered in Montebello, a high-ranking investigator has announced that they have opened an inquiry into the finances of the city. David Demerjian, the Director of the Public Integrity Division for the District Attorney, will be investigating complaints of corruption. “We have opened an investigation regarding the allegations of misappropriation of public funds in Montebello,” Jennifer Lentz Snyder, Assist. Head Deputy of the Public Integrity Division told EGP on Wednesday. State Controller John Chiang’s office has also confirmed it has received complaints related to Montebello’s mysterious bank accounts. Montebello city officials last week found themselves locked out of a long-lost bank account that at one time contained nearly $1 million. The only people who have access to the account no longer work for the city, leaving current officials in the dark as to the account’s origins and why there is only $5,000 left in it. “As far as I have been told, a statement appeared on top of the Director of Finance’s desk that should be looked into,” said City Councilwoman Christina Cortez. An employee in the finance department happened upon a statement from the previously unknown bank account, according to Interim City Administrator Peter Cosentini. What they do know is that the account was opened ten years ago in the city’s name at Union Bank, and it once contained as much as $900,000. Councilman Alberto Perez said the sudden appearance of this previously unknown account “raises a question mark” for the city. But when officials called the bank to find out more, they were told only three signatories have access to the account. One is former City Administrator Richard Torres, who retired in 2009. The bank refused to release the names of the other two, Cosentini said. It is unusual to have someone like Torres, the city administrator at the time, serve as the signatory, he said. Usually the city treasurer is assigned the role. But this is the second bank account to pop out of nowhere for city officials. The first was discovered when representatives of a local bank, Banco Popular, alerted the city to an account containing $240,000 that had lain dormant for several years. Cosentini explained the two accounts were not part of the general ledger used by the city and that finance staff knew nothing about them previously. After learning about the Banco Popular account, city officials ordered a search for more accounts like these. Councilman Frank Gomez said it is very “disturbing” that there are accounts that are not on the city’s main ledger. “We’re going to get to the bottom of it. This is very disconcerting it’s not good for Montebello,” he said Friday. The only way to gain access to these bank accounts is for the city council to vote to transfer signatories to current officials. They have already transfered signatory status for the Banco Popular account to current officials, and staff is currently requesting and reviewing the details of that account. Last night the city council was expected to consider the transfering authority over the Union Bank account to current officials. In the meantime, Cosentini said last Friday he has “traded voicemail” messages with Torres and planned on getting in touch with him. They had already been in contact once regarding the Banco Popular account, he said. Torres told EGP on Friday that because he has no access to the files at city hall, he knows as little as anyone else about the account and could only speculate. He was unsure on Friday which account was discovered. The accounts in question could have been been set up for investments, he said. In the case of the Banco Popular account, it could have been for a HUD loan program. “I’m just guessing at this point. The records will speak for themselves,” he said. If the city wants him to “run to the bank and sign for it, I’d be happy to do it,” he said. The discovery of these accounts received widespread media coverage last Friday, but some officials say Montebello is getting underserved negative attention. Current city council members say they inherited a city government with serious problems, financial and otherwise, but they are working to change things. “I don’t want to be compared with Bell. This is a different situation. This council is trying to fix Montebello,” said Mayor Art Barajas. Four out of the five current city council members in Montebello were voted in about a year ago during a contentious election season that involved a recall. Many of the department heads, and the current interim city administrator, are also recent arrivals. Former Montebello City Treasurer Gerri Guzman was contacted for comment last Friday, but has not responded. Torres said she may have been the treasurer when the Union Bank account was opened. Guzman is currently a school board member of the Montebello Unified School District. The most recent City Treasurer was Norma Lopez, but she resigned this year in January. The city council opted to leave the seat vacant until the next regular city election this November. To read more about Montebello’s financial issues, enter “Montebello” in the search box on the EGPNews.com home page. The address “3304 Drew Street” used to be the headquarters for a clique of the Avenues Gang, but last year it was dubbed a nuisance property and demolished by the city. Now the vacant lot in Glassell Park could have a new purpose as a community garden, according to the local councilman. 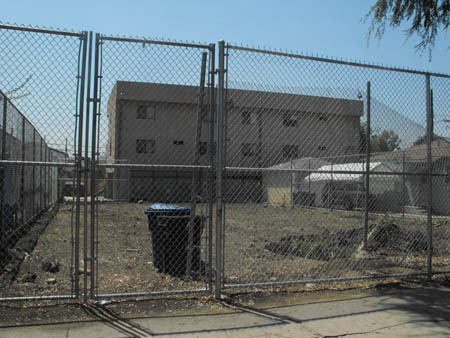 Los Angeles Council President Eric Garcetti’s office (CD-13) held an informational meeting last week on the possibility of transforming the vacant lot into a garden specifically for neighborhood residents. According to Garcetti’s communication director Julie Wong, the property was foreclosed and the last title holder, Wells Fargo, donated the property to the city. “Acquiring the property is a big victory for the community since it was a problem for so many years,” Wong told EGP on Tuesday. The Feb. 17 meeting was the first of many meetings to come in order to solicit community input. The project includes the partnership with the Los Angeles Community Garden Council and stakeholders of the Drew/Estara neighborhood, she said. For more information on upcoming meetings, call Garcetti’s Glassell Park satellite office at (323) 478-9002. A man was shot on a Metro bus in Glassell Park yesterday, apparently while protecting his teenage son from the gunman, who was later arrested, authorities said. Mark Martinez, 31, was arrested about 40 minutes after the roughly 10:30 a.m. shooting on a bus on Eagle Rock Boulevard near Verdugo Road, according to the sheriff’s Transit Services Bureau. The name of the 39-year-old man he allegedly shot was being withheld, and his condition was not immediately available. Authorities said the wounded man had stable vital signs. Metro spokesman Jose Ubaldo said the shooting occurred aboard a bus on Line 84. The victim was on the bus with his 16-year-old son, when another passenger pulled out a gun, apparently intending to shoot the teen, Ubaldo said. “The man moved forward to protect his son, and he was shot,” Ubaldo said. Martinez would be booked for attempted murder, a deputy with the transit bureau said.